as it's got a bit of meat on it. 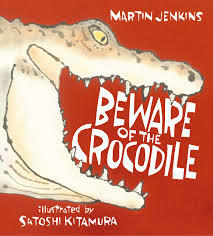 With tongue in cheek, Martin Jenkins describes for his young audience some of the distinctive features of the crocodile. By doing so, he is able to educate while also captivating them with scary scenes and impressions. First up, he wants them to know that crocodiles are 'really scary - or at least the big ones are.' That has to do with their teeth, their cunning ways, their quick action when prey unintentionally gets a bit too close. He explains it can be gruesome, but goes no further than that. He then says that a good meal will hold the crocodile for some time, allowing it to have a long, enjoyable nap (as humans often do), and to scope out new hiding places for seizing its next meal. As he tells his story, further informative text is added to the spread using a different font. "But there's more to crocodiles than SPLASH, snap, twirl, swallow. You might be surprised to hear that they make very good parents. Or mothers, we should say." He goes on to fully explain all that a mother does to lay, incubate, hatch and get her babies to the water, where she will continue to care for them for an extended time. She protects them as they grow and thrive (those who survive), allowing them to take their place along the river's edge in search of their own sustenance. An ending paragraph, suggestions for further research and an index complete this stellar book. 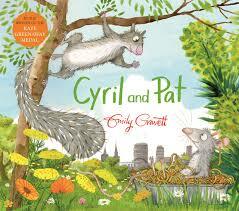 It is a wonderful way to introduce young children to the elements of illustrated nonfiction in very accessible text. Mr. Kitamura creates lively accompanying artwork to enhance the learning and to draw a child's attention to the information presented. The palette chosen seems perfect, and the horizontal perspectives ensure a real sense of size and danger for readers. On a day trip to Winnipeg yesterday, I was listening to the radio and happy to hear the news from our national weather service that we really can look forward to spring. this year. The announcer said that we should expect cold days for two weeks; then, it looks like an abrupt change to much milder temperatures. After weeks of -30 days and wind chills of more than -40, I wouldn't be surprised if people are skeptical. Perhaps reading this lovely new concept book will give a bit of an uplift to the spirits in days to come. I'm tired of the squawking crows, the screeching blue jays, the chirping of sparrows, with no backup chorus. It is always joyous to welcome spring birds home, and to sit in the porch and listen to their songs. 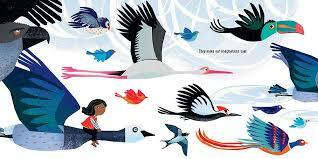 Birds of all sizes and shapes make an appearance in this beautifully illustrated picture book. Their differences in size, shape, and color are evident on every page; their natural habitats provide inviting backgrounds. The young child who narrates the book makes mention of their different needs, but shows love and admiration for each and every one. They do have one similarity. "But no matter what, nearly all like to have conversations. For every call, there is a response." 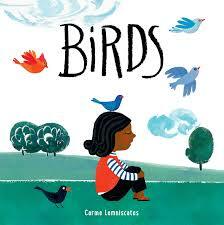 If you have a child who is showing an interest in birds, or work with children who love learning about nature, this is a book that can be shared and then handed over for a closer inspection of all the artist would like them to observe about the birds presented. As I have mentioned in other posts, don't miss the endpapers. The feathers are gorgeous and offer up a bit of a guessing game for little ones. Enjoy! Can you catch that one? Chase it over. Chase it down. Monkey lives in a tree. 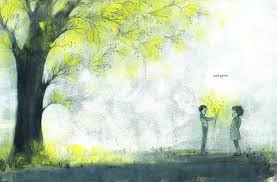 But, it is not just any tree. It is a tree that looks just like a clock! Endpapers show the smiling monkey surrounded by a collection of small-footed, orange balls, numbered 1 through to 60. The title page has that same monkey asleep in a twelve-branched tree while the tiny orange balls march forward to climb its trunk. They want to play! Off it goes, clockwise from branch to branch. Monkey gives proper chase but can't keep up. So the game goes from one minute to the next, with the monkey just missing the mark each time. One hour is almost over. There's only one minute left!" 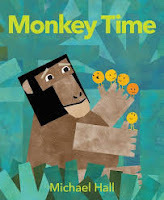 Will the monkey catch that last minute - and what will he do with it, if he does? The design is inspired, as I have found with each of Michael Hall's earlier books. They have a special space on our 'keepers' shelf! Always thoughtful, and endlessly engaging, we share them time and again. The digital collages are precise and driven by the mathematical game itself. Monkey's arm sweeps from minute to minute clockwise, always chasing time. When the hour is up, the minutes fly away and a new set of green dots begin the climb to start the next hour's worth of fun. Let the game begin again! A turn from page to page takes readers from white backgrounds showing the game's progress, to boldly colored images of the rainforest and its inhabitants, who are aware of the game in progress. In the end, Mr. Hall offers short descriptive paragraphs and thumbnail sketches of each, and further information about time itself. Stories of the immigrant experience are always welcome and are very important, especially now. Children need to see themselves in stories that reflect their experience, their families, their daily lives. This book shows how art can bridge the gap between a grandson and his grandfather; they do not speak the same language. It is an obstacle to conversation, but not to love. When his mother drops him off to spend time with his very delighted grandfather, the boy appears reluctant. He is anticipating difficulties. Lunch is served: a Thai noodle dish for Grandpa, and a hot dog, fries and a salad for the boy. Conversation is limited by their inability to communicate, as are the choices made for watching television. The boy grabs his backpack, takes out his paper and markers and begins drawing; his grandfather is impressed and does the same thing. Their love of drawing and an ability to tell stories through their imagination is the ticket to a new way of understanding each other. AWESOME! The powerfully illustrated panels show everything that readers need to know about the two men - young and old. Awkward pauses, concerned side looks and detachment are all clearly evident and uncomfortable. 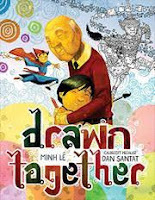 The art and story that grows from a shared love of drawing is inspirational to each, and sets up a battle of the two imaginations.The new world they build in Dan Santat's spectacular illustrations will awe readers and inspire them as well. Their styles may differ, but their love is evident in life and in art. 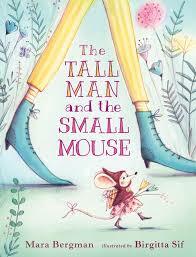 Beautifully told in both text and illustration, this is a book to be savored. "Nice to meet you all," said Rory. "My name is Rory. I sweat through my armpits, I can swallow a hotdog in one bite and I would give anything to be able to lick my eyeballs." Everybody laughed. 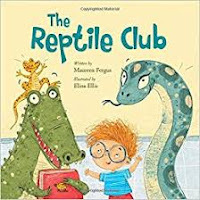 Once the new club members were comfortably settled, they talked about their favorite reptiles." When Rory arrives at his new school, he feels like most kids who find themselves in this same situation. He wants to fit in. Try as he might, he cannot find a school club that interests him - not glee, ballet, knitting, karate, theater or cooking. He explores others as well. What's Rory to do? His parents offer a solution; Rory could start a club of his own. Eureka! That club will be for kids who like animals, especially reptiles. He does all he can to entice new members. No one shows up for the first meeting, until ... he hears voices outside the classroom and is astonished to meet the first arrivals. They are a gecko, an anaconda, and a crocodile. Introducing themselves by sharing a special attribute gains a funny response from their host, and on they go. Once the other students see the reptiles their interest peaks, and Rory must do his best to convince the reptiles to let mammals join them. They have no idea how much they have to learn. There is great energy in the digital artwork created for this school story. The many details Elina Ellis includes add interest and beg special attention. 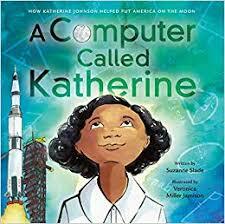 It is imaginative, informative and perhaps just the incentive needed for children to consider special interests and new learning. It's a terrific book to share with a group, full of fun and appeal. Friendship and inclusion are its heart, while providing some new learning adds to its allure. "Sometimes there are hundreds of marine mammals in a seal garden. They feed on the fish, bob like corks on the ocean's surface and wrap themselves into long copper-colored seaweed called kelp for afternoon naps. 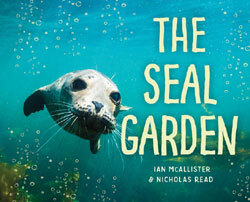 Harbor seals laze in the middle of the seal garden ... "
In this third book for the My Great Bear Rainforest series, Ian McAllister and Nicholas Read look to the sea. The first two featured animals of the land ... the bear, and the wolf. This is definitely a set of books worth having for younger readers, with enough information to educate and enlighten without overdoing it for them. The Great Bear Rainforest on British Columbia's north and central coastline is an amazing and protected environment for the many animals who thrive there. The authors include otters and fish alongside the seals as an integral part of the marine life threatened mainly by orcas and weather. Kids will be intrigued to check out the gorgeous photographs that show how the inhabitants manage to hide from inherent danger. The seal gardens provide perfect and welcome protection for the animals who find refuge there. Too small for the larger predators to get inside, they offer much needed cover. Rocks along the coast also keep seals out of harm's way by keeping predators back from the dangerous shoreline. "Orcas like to sneak up on their prey, so the fact that the seals saw them first is bad news for the whales. Even so, once they spot the seals, they chase them all the way back to the seal garden. They can see all the seals, sea lions, sea otters and river otters inside the garden, but they're too big to enter it." The orcas prove to be patient, causing the many animals in the garden stress and worry. Finally, they decide to move on. Whew! 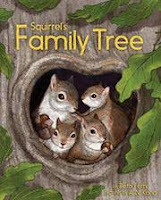 You can hear from the excerpts that this information book reads like a story for young readers while also teaching about this beautiful environment. It will make a great addition to your nonfiction collection for early to middle graders. ""There is one more rule,"
Oh. boy! 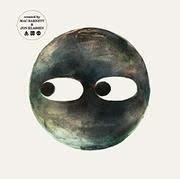 You know exactly where Mac Barnett and Jon Klassen are going with this, right? I don't get to read to kids in classrooms as much as I would like to do. I love seeing their faces and watching their responses to the books I have chosen to read to them. This one was top of the pile while visiting at Ecole New Era School on Tuesday this week. My friend Nicole asked me to visit, and I was very happy to say I would love to be there. The three groups were students from K to grade 3, and they were so attentive that it was a real pleasure being there again. I read Circle to each group, and it was well-received by all. That is testament to the writing and artistic work of these wonderful collaborators. They know kids, and they know what kids want to read. Following up on Triangle (Candlewick, 2017) and Square (Candlewick, 2018), this is the third installment in this fine and funny series of books. I have read that some call it a trilogy. I surely hope they are wrong. The kids that I read it to on Tuesday would feel exactly the same way if you asked them. Their responses to the question posed at the end of the book were numerous. We can only hope that the creators have another ace up their sleeves. The game played by the three friends ends with a surprise. Along the way, there is intrigue, some fear, a touch of humor and a question that musters up careful thought. Jon Klassen's signature images evoke all the emotions felt and spark a child's imagination as the story moves from game-playing and rule breaking to concern for the unknown. Circle's move to the darkened world behind the waterfall, and then into total darkness where only sets of eyes can be seen is inspired. What a message to send - do we fear what we don't know before finding out all we can about it? Simple and childlike is the story it tells, but is it? Let's think about that. can take two to three years." This book came in the mail today, and I thought I would share it right away. 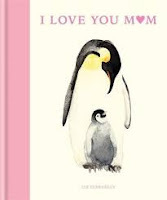 Now, you can be sure to find a copy to use in your classroom in the days leading to Mother's Day, or maybe you know a mom who would really appreciate having a copy. I am one of those 'moms' who doesn't think there is a need to celebrate just one day. So, don't wait if you feel you want to gift it earlier than May. It's important to celebrate everyone every single day, isn't it? 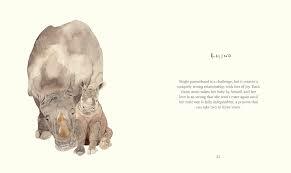 The entries follow the same pattern throughout the book: on one page a beautiful watercolor image of a mother and her baby, and on the facing page a short paragraph of pertinent and accessible text. "Motherhood is the most demanding and rewarding of roles, as these loving animals demonstrate. Let's go on a journey to meet nature's very best moms, and celebrate everything that makes our own mothers so special." These animals live on the land, in the air, and in the sea. They are from every continent. Some are familiar, some may not be. Their love for their young is evident in every illustration presented. Moms are wonders, and this little book celebrates that. As we grow old enough to start finding out about the world around us, we open ourselves to new role models. In the same way, when a gray langur baby reaches the age of two, its mom will allow other females in the group to share mothering duties, helping it to bond with its community." As well as being adorable, a baby sea otter's fluffiness plays a vital role in its safety. A mother sea otter will blow air into her baby's soft, dense fur, puffing it up like a natural life jacket, so that her little one can float safely until it learns to swim and dive just like she does." Just enough information to have young readers asking for more. This is a great format to use when presenting data collected during scientific research. There is lots to learn, and it will also suggest further reading. 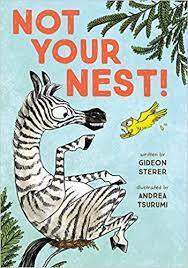 This is not your nest. This is my new nest." It is evident from the beginning that this tiny yellow bird is industrious, determined, and looking for a place of her own. The animals of the savanna that play a role in the lighthearted comedy that is about to be read have their eyes on the action as she looks to be settling down. She has spent time and effort to design, plan and carry out the difficult work that has resulted in a new home. Adding the final piece leads to an unnerving and rather annoying discovery. A much bigger bird with a pretty self-serving attitude sends the tiny bird on her way to building a new nest. And so, it goes. With each new, completed nest, the bird makes the alarming discovery that someone else has usurped her space. A fennec fox, a warthog, a gorilla ... the list goes on. Each time the bird grows more weary and more miffed. At the end of her patience, she finds a friend to help with her plight! Out they go! Feeling contrite, the animal interlopers decide to help with a new nest, and build it at the top of the acacia tree. It's much too big, and the bird is left feeling alone in a new home that is much too big for her. Hmm??? How to solve that problem? The illustrated animals are a delight, offering expressions that will capture attention and prompt discussion among readers. 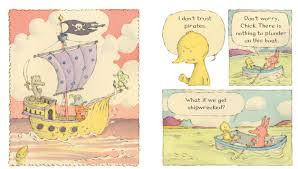 The speech bubbles allow for sharing the reading as little ones giggle and guffaw their way through the constant drama experienced by one small yellow bird. This is a fun interview with the author and illustrator themselves. "Carter was inspired by Oliver and this circle of men committed to freedom, equality, and knowledge - men whose own life stories would never be in history books. And so the seeds of Carter's own life work began to grow. "My interest in penetrating the past of my people was deepened." As I find so often when I read books by Deborah Hopkinson, I come away from the reading more enlightened, and fascinated by the stories she shares. 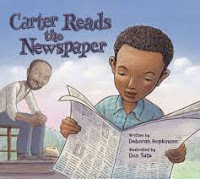 This picture book biography tells the story of Dr. Carter G. Woodson, who is called the 'father of Black History'. Highly appropriate for sharing in February which is designated Black History Month, it shares the experiences that led Carter to realize how important reading could be to all people. Carter was born after the Civil War to former slaves who told their stories to Carter and his six siblings. Life was not easy for the family. Carter was needed to help on the family farm for part of the school year; in the other months he did his best and was able to read the newspaper to his illiterate father. Through that reading, Carter learned about the world beyond the family farm. Carter gave up his schooling before high school in order to help the family. Farm work, and then working in the mines taught him a great deal and earned him new friends. Meeting Oliver Jones lead to joining other miners in the reading room Oliver opened in evenings when their work was done. Carter was more interested in the food that he was in the reading. But, Carter's ability to read afforded him the chance to read the newspapers to the men gathered there, and the knowledge that a person can learn much from others. Eventually earning a PhD in history from Harvard, he was challenged by one of his teachers to prove that Black people did, indeed, have a history. And that is what he did for the rest of his life. This is a very interesting life story, told in an accessible, conversational style. Ms. Hopkinson inspires her readers to learn more by introducing other historical figures, and opening to them the opportunity to make further discoveries of their own. Don Tate's illustrations present portraits of influential leaders, informative backgrounds, as well as realistic images of Carter and his family. Endpapers are worthy of your attention as is back matter which includes a resource list for learning more about Carter, an author's note, an illustrator's note, a list of the Black leaders pictured throughout the text, a timeline for Carter's life and many accomplishments, and quotation sources. Engaging, informative and worthy of your attention. It should be shared! "The boy who began by reading the newspaper to others transformed the way people thought about history. He fought for a history based on truth - a history that includes all people. Carter G. Woodson didn't just study history. He changed it. And we can too." You must have a PARTY! A celebration, hoopla., or jamboree. There should be games and laughter and definitely hats. Hats immediately elevate the party mood. Food is also a good idea (see Rule #3), as are streamers, confetti, and balloons. Who doesn't like having a new birthday book in their repertoire? It seems there can never be enough of them. After all, their birthday is the best day of the year for most kids. We all love to celebrate those special days with family and friends, don't we? Let the counting begin. 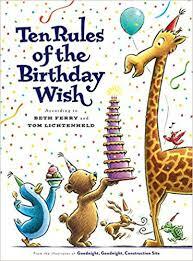 Counting up, and placing each rule in bold and large font, readers will be privy to the details that make birthday wishes so special. Each rule is presented on a double page spread, which may or may not be accompanied by following pages with exceptions to that rule. There are conditions where the exact rule may not apply because of extenuating circumstances. Traditionally the "Happy Birthday" song. Sung happily and loudly and definitely off-key. Tom Lichtenheld's humorous and detailed artwork is done in pencil, watercolor, colored pencil and pastel. Sure to elicit big smiles. the occasional guffaw, and contented sighs, it offers context for the rules as they are presented and visual information about the animals attending as well. There is much to see and celebrate. Young readers will be captivated by those animals and their unique ways of celebrating such a special day. "Truthfully, Nan had her doubts. If there was a fat giant hopping down chimneys once a year, she would probably have spotted him ... or at least heard him stomping on the roof. Chimneys were her business, after all. "I'm merry that Father Christmas saved the baby," Charlie said, pressing his fingers together. "Only I'm not sure I'd want to find him inside our chimney. Is he very frightening?" "Oh, he's terrifying. Dressed in all red, with long white ... "
What a cast of characters you will meet when you choose to read this marvelous Victorian tale of loss, terror, family, misery, and love above all! You will not forget them. Nan Sparrow and the Sweep are inseparable, and have been as long as Nan can remember. His lessons to her have been numerous, and the days they spend together are happy, if often difficult. Everything they do together is described in the first five pages. "This was life as the girl knew it. 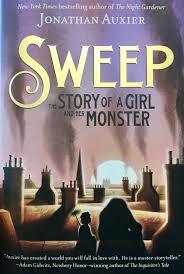 And every night she slept soundly, knowing that she and the Sweep would have each other forever." When the Sweep disappears, Nan is left with his hat, a warm lump of charcoal, and an abiding love for the man who was her mentor and stalwart companion for so long. Going on without him is heartbreaking, but Nan is strong, smart, brave, determined, and often outspoken among the group of sweeps owned by the abusive Crudd. A frightful chimney fire allows escape for Nan. And, it gives life to the bit of 'char' the Sweep has left in her care, who saves her life. Naming her protective golem Charlie and striking out on their own, the two manage to make a life for themselves in an old abandoned house. Life in Victorian London for children who sweep chimneys is harrowing, and fully realized in Jonathan Auxier's outstanding storytelling. There were times when I just had to take a breath before reading on, but those breaks were few and far between. Nan's story is compelling, heartbreaking and forever hopeful. She finds and gives support to those she loves, and welcomes help from Charlie when needed. She is also a protector of the naive golem, only wanting what is best for him at all times. In the final touching scenes, Charlie does what he has always done. Only then does Nan fully realize (as Miss Bloom has earlier told her) her golem is not an immortal, and she must learn to say goodbye again. There are two sections, Innocence and Experience. Each brilliantly describe Nan's life. The characters brought to life are memorable, as are their many experiences ... good and bad. The setting lives and breathes, the community created is meaningful, and the novel itself deep and satisfying. There is darkness; there is also brilliant light. Part fantasy, part truth ... it is a story for the ages. Don't miss it! others think that ... "
It has been said that there is only one way to be a lion. Do you think that is true? If you think that all lions are fierce, you haven't yet met Leonard. He will change your mind about the preconceived notions you have concerning lions and their behaviors. 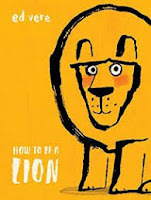 There are many things Leonard loves to do that do not fit the mold generally attributed to the 'king of the jungle': Leonard loves having the sun warm his back, taking time to think, humming a new song, and thinking poetic thoughts. In fact, should Leonard meet a duck, many think that would be the end for said duck. But, they don't know Leonard and they haven't met Marianne. Marianne is a perfect companion for Leonard. They are both poetic, They like to lie in the sun. They like to play together, and to take long walks while conversing about all manner of things. and made wishes if they saw them. They wish for nothing more than this." Coming upon a pride of angry lions demanding more appropriate behavior from one of their own has Leonard questioning his better instincts, and Marianne quaking in fear. 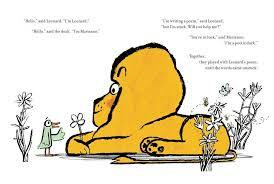 In time, Marianne helps him design a poem that Leonard is brave enough to share with the other lions. I guarantee you will be impressed by it. 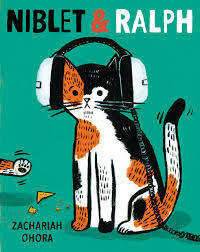 The two friends are the focus for this thoughtful tale, appearing happy together on warm and unencumbered backgrounds. They prove that being a lion, and being a friend is a worthy pursuit. Ralph's, no one was home. nobody was home there, either. Kids who love cats are going to love this story. Gemma and Dilla live in the same building. However, they do not know each other. They do have cats that look eerily similar; the two cats do know each other. In fact, they talk on the telephone together every single day, and lay in the same sunshine as it comes through their respective windows. Tired of phone calls, the two decide to pay each other a visit. When the opportunity arises, they make their escape. It is not a good plan as each apartment is empty of its inhabitants. When the two children return home wanting to spend time with their pets, they are surprised at the cool reception they receive. It isn't long until they realize they have a big problem. Their parents show no concern, and insist that they get some sleep. Impossible! They cannot sleep for fear of what has happened to their beloved pets. Their parents remain convinced that nothing has changed. 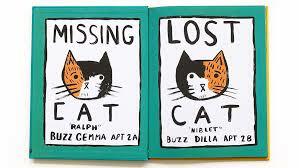 Gemma and Dilla know they are wrong, and set out on their own to find the missing felines. Their search leads them to an unexpected discovery! And ... all's well that ends well! The colors are bright, the setting is warm and welcoming, and the details presented are engaging for young readers. 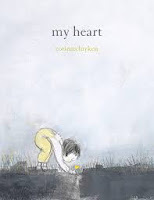 Corinna Luyken captured my heart in her first book for young children, The Book of Mistakes (Dial, 2017), and then again in Adrian Simcox Does NOT Have a Horse (Dial, 2018). Today, she has done it again. What better day for talking about the power your heart holds than Valentine's Day? The heart the author describes belongs to a child. There are many wonderful things that heart can do. It is at the discretion of the heart's owner to keep it open, or to close it; it can be a window to the world or a door to its impact. While there are days when it protects from darkness, it can also open a child to the beauty of a wider world. Readers are encouraged to look to their own heart, and face the world's many possibilities. The language has a gentle rhythm, and a concern for finding better days among the dark ones. There is always hope when care is given to keeping the heart whole and strong. 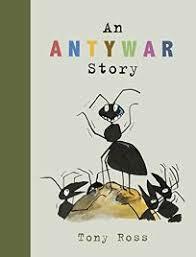 In tones of black and gray with gorgeous sunny yellow, Ms. Luyken shows emotion at every turn, and offers an opportunity for discussion concerning the many emotions felt by children. 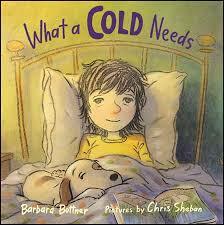 Sensitive and ultimately uplifting, children are sure to find themselves within its pages. They will be intrigued in a search for the many hearts displayed as well. a light, and a guide. Such power in beautifully chosen words! place gets tight ... "
One of the songs I always sang to my kids when they were little was Hush Little Baby. I have carried on that tradition with my granddaughters when are here visiting. Lullabies are very special songs for young ears. The catchy rhymes and calming rhythm bring a feeling of peace and contentment. 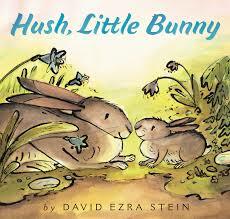 David Ezra Stein changes the song up by setting it in the warmth of a sunny spring day. We know those days are coming, although it is hard to believe given the deep freeze that has us in its grip. I thought today, as we await another dump of snow, might be the perfect day to tell you about it. Maybe you are thinking Easter and want a special book to celebrate the arrival of spring-like weather. A father bunny has to do some coaxing to get his little one to emerge from their burrow. The first thing they do together is to say goodbye to the snow as the sun warms the earth and causes it to melt. Once they are out and about, there is enticement in the the blue sky above and the delicious emerging plant life on the ground. There is so much for the two of them to enjoy together. As they go, the father teaches his little one what he needs to know about this new and wonderful world. The text is encouraging at every turn, and always informative as the two make their many discoveries. 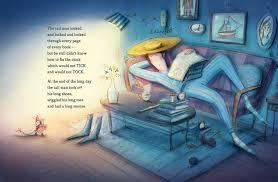 The sunny mixed media illustrations add warmth and delight throughout the singing ... and sing it you will. "The way Tom ran was different, too. In those days, most runners took long, high strides with their hands up and still. By keeping his feet close to the ground and his hands low, Tom saved energy as he ran. Not every race ended with a win, but Tom was becoming known as a top racer." 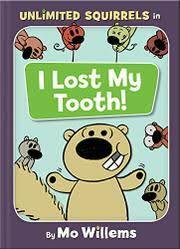 This is the third book in the Scholastic Canada Biography series. The first two featured Viola Desmond and Chris Hadfield. 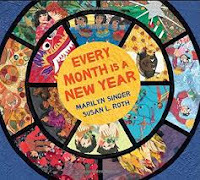 Each of the books in this series is deserving of your attention and a place on the shelf where you keep picture book biographies. They have much to share concerning prominent and admirable Canadians. Your students will find them enlightening and engaging. 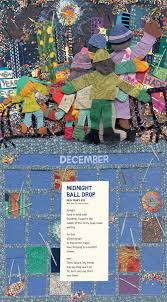 They will enjoy the accessible text, the design, and artwork of each. 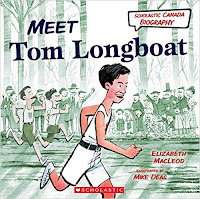 Tom Longboat made his mark as a long distance runner. An Onondaga member of the Six Nations, his accomplishments are many. 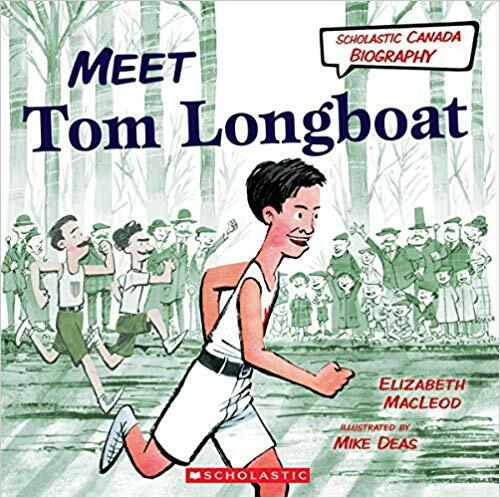 Ms. MacLeod begins with Tom's early life ... a life filled with running and fun. Sent to a residential school at 12, Tom hated life there. In his second year, he ran away twice and never went back. It would be five years before he entered his first race in 1905. When he came second, he decided he would not lose again. His training was unlike that of other runners. People were not impressed and made their feelings known. Tom was doing then what many runners do now. As his fame grew, the people of Canada celebrated. only in Canada, but all over the world." His fame continued to grow, despite failure at the 1908 Olympic Games in London. Then, war changed everything. Tom served, and returned home in 1919 to find that running was no longer a revered sport. He could no longer earn a living doing what he loved. So, he got a job, cared for his family and eventually moved back to the reserve he loved. He died in 1949, but his spirit lives on in the Tom Longboat Award given to top Indigenous athletes yearly. Well researched and presented in a conversational style, this is a welcome addition to a stellar series. Liz MacLeod is an accomplished storyteller, and Mike Deas fills the pages with energy and color in historical settings that help with understanding. The speech bubbles will be much appreciated by middle grade students wanting to know more about notable Canadians. Backmatter provides a timeline for Tom's life, and archival photographs. And there's more light ahead. 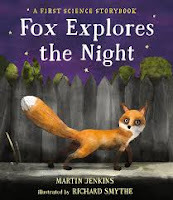 In this third book in the A First Science Storybook series, author Martin Jenkins and artist Richard Smythe use a young fox in her search for food to help their target audience understand the concepts of light and dark. As she emerges from her den, the hungry fox is faced with bright sunlight, a lot of morning action, and many people. Not wanting to be discovered she returns to the darkness of the den. Later, she is even hungrier and the people have gone. Darkness has descended. She is ready to hunt, and her sharp eyesight will be an asset. Moonlight helps as well, and soon she spots a mouse. The mouse proves elusive. The fox must look elsewhere. As she searches, she faces a surprise and other obstacles to her understanding and safety. Using her keen sense of smell she finally finds something to eat. Her search has come to an end. She returns to her den by the light of the moon. While focusing on the fox and her search, the premise of the book is to educate young readers about light and dark. To that end, the simple language and visual awareness of the many types of light found in the dark of night provide an appealing learning experience for little ones. 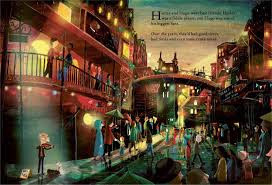 The mixed media illustrations effectively portray shadows, beams of light, and the differences between day and night. Discussion suggestions for adult readers in frontmatter, and questions to ponder in backmatter are useful, as is a simple index which helps in understanding how information books work. The first two books in the series are Squirrel's Busy Year and Bird Builds a Nest. Caterpillar and Bean is due in April. Check for them at the library or in your local bookstore. "WHAT ARE YOU DOING, FOX? I'm going for a quiet boat ride. I guess it doesn't have to be quiet. Can I be the captain? We don't need a captain, Chick. Captain Chick! That sounds good. What does a captain do, Fox?" Oh, I am very pleased to see Fox and Chick again. I loved their first book, The Party: And Other Stories (2018), as did everyone who read or heard it. They are a pair; their adventures are quite delightful despite the fact they are polar opposite personalities. The three short stories in this new book are adventurous, and will be appreciated by fans of the first one and all emergent readers. Told completely in speech bubble dialogue between the two, their stories are told with warmth and humor as they seek common ground. 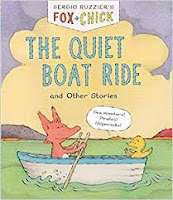 Fox is wanting a calm and peaceful boat ride. Chick is seeking companionship, and fills the quiet of the pond with constant conversation, observation, and questions.Chick needs reassurance that sea monsters don't like ponds, pirates would find nothing to take if they came aboard the boat, and being shipwrecked is not a possibility when the pond's shore is so close. The imagination can conjure up many fearful, things! The second tale concerns a gift box filled with chocolate cake, and is equally charming. Finally, in a story about Fox wanting to see the sunrise, that plan is foiled by patience as Fox waits - and waits - and waits for Chick to get ready to go, too. The end result is full of meaning for both. Fox remains unflappable, while Chick is totally flappable. 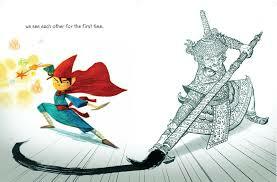 But, in the end, their friendship is what will resonate with young readers. 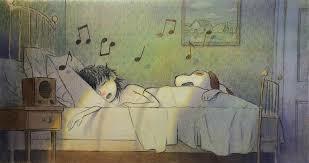 I have great admiration for Sergio Ruzzier's storytelling, his playful, inviting art, and his tales of true friendship. BRAVO! Wow! What a perfect book to be sharing these days! Seems that everyone I talk with has a cold - on the phone, on FaceTime, in person. It is that time of year. I Love to Read month is just beginning, and I will be toting this book from school to school as I visit. Can't wait to share it with kids - and adults, as well. I love everything about it. This young child is as unhappy as any of us are when confined to bed with a cold that needs a lot of care.The red nose, sad demeanor and lethargy are right there for all to see when we turn to the first page. A warm bed, birdsong and raindrops lift spirits, as do the many other efforts meant to help one so sick feel more comfortable. Young readers will recognize themselves in many of the small scenes. Have you been there? I think is a universal affliction. While every attempt to make it better can be helpful, nothing works as well as the cold playing itself out and moving on ... unless it's to someone in close proximity. Poor Dad! The warm and reassuring text is matched perfectly with Chris Sheban's illustrations done in watercolor, colored pencil, and graphite. Each image reflects empathy in soft tones and comforting settings. I have a few favorites - the child blowing a red and runny nose while used tissues can be seen everywhere, the dog's ears blown back with the power of the next sneeze, and the warmth of an afternoon nap, with soft music playing in the background, mouth wide open in an attempt to breathe, and the company of a loving pet. his tail wagging ... "
Hector and Hugo are best friends. Hector loves to play the fiddle and dreams of being famous. Through good times and bad, Hector plays and Hugo listens intently to every note. When fame proves elusive, Hector decides to retire. Sure that no one wants to listen to an aging musician when they can turn their attention to a famous bear who plays piano, he admits defeat. What? A bear playing a piano? Do you remember him from an earlier post? 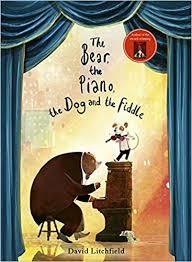 The Bear and the Piano (2015) hit a bright spot with children in times past. Lucky we are to meet the Bear again in this new story, with Hugo and Hector as brand new characters. Hector spends more and more time at home, alone and sleeping. He does not notice that Hugo is keeping busy with the discarded fiddle. The neighbors are amazed that a dog has such talent, while Hector is oblivious to what is happening right under his nose. Then one night, he leaves his window open, hears a familiar sound, and makes a surprising discovery. Setting aside his personal feelings concerning his own career, Hector recognizes Hugo's love for the music and finds new purpose in teaching Hugo as much as he can. That is when the Bear makes his first appearance, offering Hugo a chance that might never come again. It is terribly hard for Hector to let him go. His jealousy has him saying things he never meant to say. Hugo is gone before he can apologize. World-wide recognition for Hugo is wonderful. Watching and listening from so far away sparks interest in playing again for Hector ... but, it doesn't bring back his best friend. When the band comes to town, Hector finds a spot in the first row. What happens next is another lovely surprise for readers ... and for Hector! David Litchfield's mixed media illustrations are glorious! The choice of colors, the infusion of light on every page, the detailed, expressive scenes draw readers into the story and hold attention throughout the entire book. Emotional, tender and just plain wonderful!